State Department spokeswoman responds to Minister Ya'alon's comment that Obama is responsible for construction freeze. 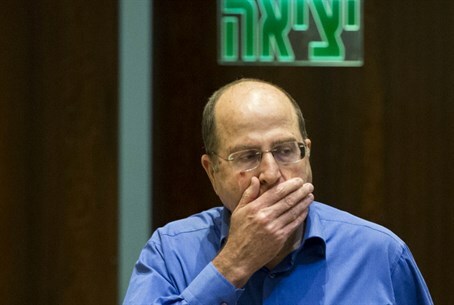 Moshe Ya'alon at the exit? The United States on Wednesday responded to Defense Minister Moshe Ya’alon’s statement that a building freeze in Judea and Samaria was due to pressure from the Obama administration. Speaking to reporters in Washington, State Department spokeswoman Jen Psaki said that objection to “settlements” was longstanding and would not change after President Barack Obama leaves office in 2017. "Our policy has been consistent for quite some time," Psaki told reporters, according to The Associated Press (AP). Ya’alon’s comments were made in a conversation with students at the Mekor Chaim Yeshiva in Gush Etzion, the school attended by two of the three teens murdered by Hamas terrorists in June, and while there he was asked an uncomfortable question. In recordings of the meeting broadcast on Army Radio, student is heard asking Ya’alon about the unilateral freeze on Jewish building in Judea, Samaria and eastern Jerusalem. Ya'alon answered by blaming President Barack Obama, noting that pressure from Obama led to the freeze, and adding "but this administration won't last forever." Relations between Washington and Jerusalem have been tense for months, with the tensions coming to a peak in October when journalist Jeffrey Goldberg published comments by unnamed officials in the Obama administration, made up of a series of derogatory names and insults directed at Prime Minister Binyamin Netanyahu, including descriptions such as “chickens**t” and “Aspergery”. U.S. Secretary of State John Kerry later phoned Netanyahu and apologized for the harsh comments about him, making clear that the remarks do not reflect the position of the American government. Ya’alon himself was at the center of a media storm several months ago, when he was quoted as describing Kerry as "obsessive and messianic." The U.S. responded with shock , calling the remarks "offensive" and "inappropriate." Ya'alon later apologized for the remarks, stating that he had no intention of "offending" Kerry.